A modern, responsive boilerplate laid bare. Build using CSS Grid for more flexility than 12-column layout. Simple theming using CSS Variables including example "dark mode". Ready for upcoming drafts including prefers-color-scheme, env vars. You should use Barebones if you're embarking on a smaller project or just don't feel like you need all the utility of larger frameworks. Barebones only styles a handful of standard HTML elements and CSS Grid, but that's often more than enough to get started. In fact, while this looks like the original Skeleton site, it's made using Barebones, allowing lighter html and more flexible CSS. Barebones also includes support for legacy Skeleton sites without changes. Use Barebones and want to lay yourself bare? Let others know! CSS Variables allow Barebones to maintain it's independence on additional tools such as CSS preprocessors SCSS or Less, while gaining centralized management of global values. This allows for much easier theming and rebranding. The default theme maintains the color choices from Skeleton, although a few very similar colors were consolidated. Colors are based from a theme hue, which defines the normal text color. Additional richer and softer text colors are then defined. The choice of those keywords is to prevent confusion with light vs dark themes. For example. in a light background theme, softer would mean a lighter color than normal, ie less contrast with the background, but if the base hue is dark, softer would be darker to decrease the contrast. A dark theme is included in Barebones inside a prefers-color-scheme: dark media selector. This is a new selector not widely supported by browers yet, but demonstrates a second theme. Barebones replaces the fixed 12-column grid with CSS Grid: a more flexible and powerful foundation supported natively in CSS. If you've ever fought a Flexbox layout to do what you want, you'll probably find CSS Grid a lot easier to work with as it was designed specifically for laying out in two dimensions. Barebones only includes a few basic layouts, but note the Fifths wouldn't be easy with the 12-column layout. There's a lot of possibilities with CSS Grid and great resources available without repeating a how-to guide here. Type is all set with the rems, so font-sizes and spacial relationships can be responsively sized based on a single <html> font-size property. Out of the box, Barebones never changes the <html> font-size, but it's there in case you need it for your project. All measurements are still base 10 though so, an <h1> with 5.0remfont-size just means 50px. The typography base is Raleway served by Google, set at 16rem (16px) over a 1.6 line height (24px). Other type basics like anchors, strong, emphasis, and underline are all obviously included. Headings create a family of distinct sizes each with specific letter-spacing, line-height, and margins. Buttons come in two basic flavors in Barebones. The standard <button> element is plain, whereas the .button-primary button is vibrant and prominent. Button styles are applied to a number of appropriate form elements, but can also be arbitrarily attached to anchors with a .button class. Forms are a huge pain, but hopefully these styles make it a bit easier. All inputs, select, and buttons are normalized for a common height cross-browser so inputs can be stacked or placed alongside each other. Reason for contacting Questions Admiration Can I get your number? One change from Skeleton is that font-size does not decrease with nested lists, instead using the --text-color-softer variable for nested list color. This allows deeper nesting without readability problems. Code styling is kept basic – just wrap anything in a <code> and it will appear like this. For blocks of code, wrap a <code> with a <pre>. Be sure to use properly formed table markup with <thead> and <tbody> when building a table. Barebones uses media queries to serve its scalable grid, but also has a list of queries for convenience of styling your site across devices. The queries are mobile-first, meaning they target min-width. It means all styles outside of a query apply to all devices, then larger devices are targeted for enhancement. This prevents small devices from having to parse tons of unused CSS. With the upcoming env() variables in CSS, Barebones will be updated to make media queries top level variables to easily change breakpoints as desired. Barebones has a number of small utility classes that act as easy-to-use helpers. Sometimes it's better to use a utility class than create a whole new class just to float an element. If you have a site originally build with Skeleton and want to migrate to Barebones without breaking everything at once, we'll help you keep those skeletons hidden in the closet. Simply include the skeleton-legacy.css file to provide backwards compatibility for all classes removed from Barebones. The legacy classes, which mostly applied to grids, have been updated to use Barebone's CSS Variables and CSS Grid system so any overall changes will still be applied across the entire site. See below for a demo using the html from the original Skeleton site styled with Barebones and legacy css. 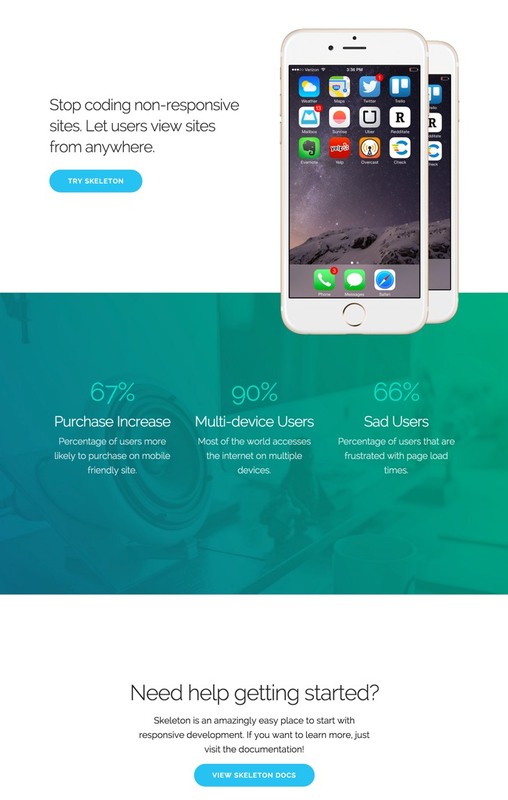 The landing page example from Skeleton with only two changes: barebones.css and skeleton-legacy.css. Total time to convert: 5s. 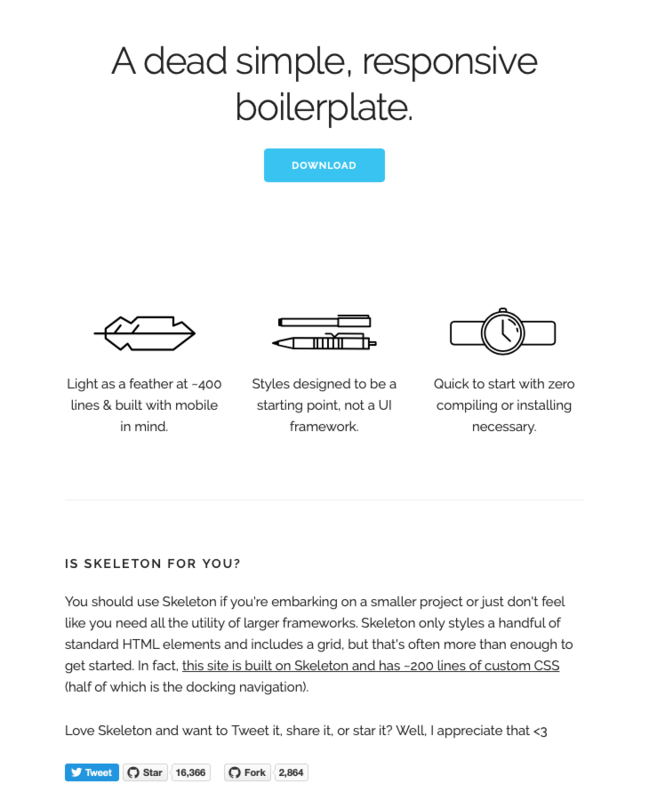 The orignial project page (this page) from the Skeleton repo, styled by barebones.css and skeleton-legacy.css.